There are websites dedicated to reducing spam via email blacklisting. They don’t all perform the same function but around 300 do similar jobs in that they act as clearinghouses for IP Addresses that have been reported as spam by someone else. We have probably explained some of the basics of spamming before you reached this page. But in case you’re learning about spam for the first time, additional resources are added below. We hope these resources help you better understand and avoid spam (not the food). When someone sends out spam, it is possible for the recipient of the email to mark the email as spam. When an email message is flagged as spam, the email is reviewed for blacklisting. If the email is determined to be spam, the IP address and/or the email address that sent the spam may become blacklisted, especially when multiple reports are made from additional sources. A. If you are not receiving messages from a certain contact, it is possible that the contact has been blacklisted. B. You may be receiving bounceback messages saying that your mail was not delivered. In this case, it may be that your server or email address has been blacklisted. If you’re a gmail user a possible solution is to pull your emails from the server. Inexperienced email admins may forward your email from the server to your gmail inbox. This may work for a while. By forwarding emails, ALL emails will be forwarded. This includes spam. Google doesn’t like spam and if you are forwarding hundreds of spam emails to gmail they have to use resources to run those spam emails through their own spam filters. If it’s too much, they may delay your email before sending it to your spam folder. When a large email host with millions of email users is involved, like Hostgator it can cause Google to use more resources than otherwise necessary. This is somewhat dependent on Hostgator’s own spam filters but it’s easy for Hostgator to just ignore spam and reduce tech support calls. Forwarding is only a short-term solution. The best solution is to correctly enter your pop, imap, smtp settings in Gmail and pull your emails into your account. This is a clear signal to Google that you want the email. Once your emails are being pulled into your Gmail account it is then important for you to mark spam emails as spam. Doing so signals Gmail you are taking an active role and helps Gmail reduce spam based on your preference. This is a more trusting relationship. Gmail maintains their own spam blacklisting services. The following resources are provided to help you understand email blacklisting at Hostgator. These resources may or may not be helpful for dealing with email blacklisting at other web hosting providers. At Brent.FM we take spam seriously as a precursor to resulting problems such as malware. Like a poorly maintained car, spam can lead to technical problems outside of your inbox. A spam problem can lead to a website problem under the same domain. We use various strategies to resolve spam problems, protect your domain from blacklisting and your website from attacks. Our Fully managed WordPress hosting solutions can help save, preserve and enhance your domain’s visibility in search. Congratulations, your entire website will soon use ssl security. Your website is now hosted on a dedicated IP Address. Soon you will see HTTPS:// preceding your domain name in web browsers. Traffic to and from your site is being encrypted and sent through secure socket layers. Secure online banking, shopping and military websites use secure socket layers for confidential, financial, health, legal and government data. SSL security is also great for SEO as this type of security is also an official Google ranking factor. The certificate you have recently ordered is being installed on your account. It will need to be renewed each year. All WordPress Managed Hosting Plans include yearly ssl certificate renewals. If you are unable to reach your website by domain name, please allow few hours for your domain to fully propagate. Once propagated, we will review all assets on your website for security. The private SSL requires a dedicated IP to be assigned to your account. That is why it often takes a few hours before your domain starts to propagate to the new IP. During this time you may NOT be able to access your website by domain name. Thanks for your patience. We’re excited to be working with you on this security improvement. Apple and Netscape partnered with the government to sue Microsoft over free browsers. That was the foot in the door. It’s been open since and getting worse every day. Apple have never been a target. But for ten years we’ve been telling folks that it will happen. A business plan. If you’re seeking additional investment, start with a one-sheet for your business. With a clear direction set for financial gain, consider the impacts your business will have on our island’s sustainability. People buy for “why you do it” more than “what you do.” So understanding your business’s value proposition in the greater context of good can also open new revenue opportunities. Now it’s time to match up your need for a return on your investment with your value proposition with your online brand. You’ll need to understand your online brand. To get this awareness, do a short-form branding exercise. A domain name. Short, memorable, easy to type and helps your visitor associate your domain name with your brand. Free website tools – Square D, webbydo, website.com, godaddy, hostgator etc. These providers all offer a free website platform and hosting service. They are particularly lacking in security and performance but generally work in non-competitive industries. None of these platforms are actually free. They add on fees for domain name use, email, bandwidth, storage and monthly hosting. These all seem pretty fairly priced and you only get what you pay for with the free website tools. They may also be difficult for a web professional to work on later since they are rarely standards-based. The costs usually work out to $http://brentnorris.com5-$http://brentnorris.com50 per month. Low cost website development tools – Adobe offers Dreaweaver and other tools for subscription prices but honestly, if you’re going to learn a desktop application to build your website, you’ll become a web professional instead of the business you wanted to start. Nearly all of the costs of web design/development tools are hidden in a learning curve. The software subscription is around $50 per month. WordPress.com is one of bright spots. The .com version of WordPress is hosted online. You can start in 5 minutes and get up and running in about an hour or a week depending on your needs. The downside is that WordPress.com is geared towards writer more than business owners. Businesses are welcome on WordPress.com but cannot display advertisements and are limited in other ways. You can expect costs around $30 per month. WordPress.org is the self-hosted version of WordPress that’s used by the major hosting providers. There are no limits and you own a license to use the software for anything you wish. Typically, the cheaper, shared web hosting plans will include a control panel that allows you to easily install WordPress on your server. Building your website. Getting started in WordPress is pretty easy. Once you get WordPress installed and you login to your dashboard for the first time, things start making more sense. You’ll find settings, menu, media and sections for adding pages and posts. You’re not setup with the WordPress default theme. You can change themes easily, add and configure plugins for security, performance, seo, analytics and spam. Once you have your basic pages setup, you’ll be spending time working on those pages so they are good “Landing pages.” This means providing all of the information a visitor needs to make either a buying decision or get in touch with you to get more information. Forms are pretty easy to setup but you’ll need to either install a plugin or use the contact form that comes with the particular theme you select to match your brand’s needs. Adding pdfs, video, audio and other rich media files and content can helpful at getting inbound links to your site and reducing bounce rates in your visitor trends. There are broken link checkers, page speed testing and general seo tests. Running these tests will help you understand the value you’re adding to your pages. Do you really have “permission” to send an email? MailChimp is a permission-based newsletter delivery service. Permission means that the receiver has requested your email. The only way to confirm that you have permission is when a user makes the confirmation and has double-opted into the mailing. A double-opt-in is when the user subscribes, receives a confirmation email and replies to that email confirming their request to subscribe. Anything else is single opt-in or spam. A single opt-in is when the user subscribes but does not reply to the confirmation email. Even users that consider your email valuable may mark their email as spam. Spam is when the receiver has not requested an email from you. If your efforts or the efforts of an outside agency cause harm to your domain and email addresses, we may be able to help. It will take months to attempt to resolve these problems. The process is often too convoluted, time consuming and difficult to navigate without extensive email administration experience. When deep problems arise many small business owners choose to buy a new domain name and rebrand their company. Very expensive indeed. This would be an epic failure on many levels. This article attempts to prevent these issues and manage your domain in a way that builds trust, domain authority and rank among search engines, spam clearing houses and other service providers. The CAN-SPAM Act of 2003, signed into law by President George W. Bush on December 16, 2003, establishes the United States’ first national standards for the sending of commercial e-mail and requires the Federal Trade Commission (FTC) to enforce its provisions. To understand spam, read the Can-Spam Act. Also read the FTC Compliance Guide for Business. When you do not trigger an account warning or suspension and your results all fit within known industry standards for bounce-backs, unsubscribes and spam reports , you have conducted a permission-based email campaign. When you have delighted your readers ie; email recipients, your numbers will reflect your efforts and you can then consider your campaign successful. But what if you got verbal permission? Maybe someone added their email to a list you collected at an event. Maybe they gave you their business card and verbally asked for an email. This is called a “contact or a lead” and it is not an email for a permission-based marketing campaign. We call this a rogue email. Could be good, could be a misspelling or just an attempt to make you happy. These emails must be converted to permission-based emails for marketing through MailChimp or other permission-based marketing service providers. When you brand is in alignment with your goals and actions, confusion in marketing dissipates. Pono marketing becomes possible. Here’s a few steps you can take to get your rogue email lists into a usable condition for a permission-based marketing with MailChimp. To convert non-permission-based email lists into a permission-based MailChimp list you must sanitize. Sanitize is not the same as clean. Send email asking for unsubscribe or indicate a preference eg; name, employer or occupation. Consider including an offer to edit their preferences – include MailChimp (MailChimp edit prefs link). If preference is updated at MailChimp, email is good. Merge sanitized lists into MailChimp using MailChimp Import. Include an offer or information only available through this and similar emails. The idea is to create desire to receive your emails. Monitor campaigns for unsubscribes and spam reports. The idea is to know what worked and what didn’t. Have a strategy for account being shut down. Plan and prepare. Make sure automated publishing is not sending too many emails to your subscribers. Change your mindset. Publishing should start and end at WordPress. Thinking of emails as something different than a post is old-school. Viewers smell old-school and unsubscribe. Remember, it’s not about your needs, it’s about your subscriber’s need when you reach out to them and expect to keep them as subscribers. At a minimum, email content directed at subscribers should be included in website posts. So why not start and end with WordPress as your central publishing hub? Get educated. Watch MailChimp video tutorials, read knowledge base articles and follow all instructions. Using your domain name or other hosted email services to send spam emails. This can cause many problems beyond email marketing. If you are a Managed Hosting Client under the Business Advantage Plan, we are monitoring activities on your server for spam, blacklisting, greylisting and other issues that may prevent you from a successful marketing campaign. The health of your email is an integrated part of the health of your domain name. We only host websites with healthy domain names under our managed hosting accounts. For our client’s it’s easier and more affordable when we manage email and website hosting. We manage your brand professionally as well as your website’s healthcare. To help you better understand what Managed Hosting means, we have written a primer on the Basics of Managed WordPress Hosting. We’re always available to provide a price quote for setup and ongoing maintenance of your permission based marketing campaigns using Emma, Constant Contact or MailChimp. Learn what we do to setup and manage your permission based marketing platform. Are You Really Ready to Advertise Online? New and Existing Clients! If you're ready to advertise now, visit our Online Advertising page. Have you unsuccessfully tried online advertising? New to online advertising? This post will provide some simple insights into Google Adwords and our local Google advertising services. With around $200 US you can do a real test for a real return on your investment. An easy to read, reporting of the facts will show you exactly how your money was spent. Visit Google Adwords and use the online form to fill in some details about your business. Create your first campaign. It’s not difficult. You can do it! Fund your campaign using a your credit card. Review campaign details, spending limits and run your ad. Are you ready to advertise but not sure you have the time? Our Local Google Advertising services are for busy professionals that want us to handle all the details. It’s not more expensive. First to learn about your business and advertising goals. We’ll explain how it works and what to expect. We’ll also explain why we recommended a $200 starter budget. Our second meeting is to share our advertising plan and details of your first campaign. We’ll tweak it with you. Our third meeting will be to collaborate on the results. You’ll see exactly how your ad budget was spent. If there’s a return on your investment after using Google Advertising Services, you can decide to run a second campaign. We provide the advertising experience and knowledge of Google Adwords online advertising. We set everything up including professional ad copy, your Google Accounts or we’ll use your existing account. We analyze your website landing page for your target audience. For an additional fee, we can optimize your landing page for search engine traffic. No website, no problem. We can also direct online advertising leads to your email and or phone number. In local advertising, nuances count. Simple things like local ad copy can influence clicks from local customers. We also provide Facebook, Twitter and dozens of other options. Depending on your business we may recommend another advertising program if we feel you could get a better return for your advertising dollars. We have experience managing over 100 different ad networks and have conducted advertising campaigns in most mediums including radio, television, billboards, interactive story-cards, permission-based email marketing. We create the content, run the ads and provide the data analysis so you can decide what’s best for your business. Most likely, we’ll recommend Google Advertising Services for your first campaign. The slide above attempts to describe why professional website management is important and necessary. The effort required to manage small business websites is increasing. Visitors are expecting more of websites. Responsive designs that perform well on any device are the new normal for business owners seeking online revenue. In Hawaii, ecommerce is helping traditional brick and mortar retailers stay competitive. Online business owners expect more from web professionals. Unless your revenue increases proportionately it’s difficult to afford the knowledge, skills and abilities required to maintain the online portion of your business. Managed services have an economy of scale that works similar to hiring an outside contractor without the added expenses. Selling products and services online requires a very similar feature set as a large business. Ecommerce websites have increased security, performance, content management and promotional requirements. Lead generation and sales requires content marketing, lead capture, sharing and follow up requirements that must be created and managed to be effective. Social media has it’s own set of unique requirements and specialized knowledge. Engagement and follow up is required to warm a lead into a sale online. The basics of maintaining a content management system, plugins and themes have their own regular updates as security and performance updates become available. As hackers find more vulnerabilities, servers and the core code that runs your website must be updated. End to end encryption technologies are now considered requirements for cost control. WordPress is still the best platform choice for two reasons; 1. It’s has the lowest maintenance costs and 2. New features are more affordable, easier to install and automate. Whether it’s WordPress or a homegrown website built using Dreamweaver, Drupal or Joomla, the platform you choose will have it’s own growth and support costs. Small online business owners benefit greatly when total costs of ownership are considered carefully before any money is spent. Everything should be measurable and costs should be reduced each step of the way. 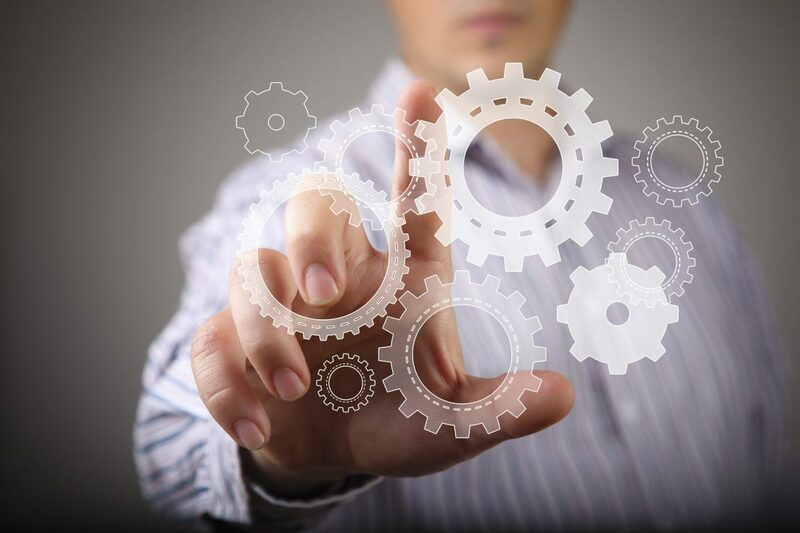 Automation can help a small business owner in several ways. WordPress publishing automation – Write a post in one place and it can publish to all your social media networks. This is really easy to get wrong. Doing it right gives your brand the best possible introduction to potential customers. Google Analytics and Webmaster Tools – All major search engines have their own webmaster tools. Acquiring and understanding this information can help you identify what’s working and what’s not working. This is similar to brick and mortar storefronts. When a visitor comes into your online store, you need to know why, where they came from and the path they took to the cash register. Permission-based Marketing Campaigns – Automate posts to targeted user’s inboxes using constant contact and mailchimp. When setup properly you can set it and forget it. Your analytics can be directed through the same automate reports you setup in Google Analytics. Security – Increasingly difficult to automate but starting off with Securi and or Wordfence is a good start. Active blocking of network IPs and domain name patterns is the new norm. It’s increasingly too expensive for a small business owner website to get blacklisted and blocked by Google. Look for this to get less attention yet create much larger impact than the recent Sony hacking. Sony gets hacked and it’s a national emergency. Millions of small online business websites get hacked and no one knows. To be clear, whole-site SSL and unique IP address will be the new normal for security and seo. Performance – Can still be automated but like security, must be monitored. Like your social media accounts, page speed is now a Google ranking factor. If you think getting blacklisted for malware on one of your pages was bad, imagine getting ignored for pages loading too slowly and not knowing it’s happening. Consider having your designer/developer minify your code, re-optimize your images, reduce server response times, use dynamic caching, mem-caching and varnish. Use content delivery networks. 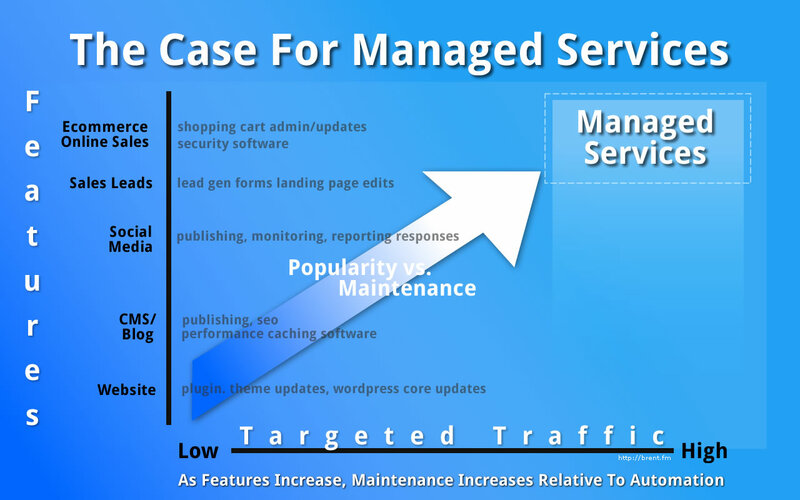 2015 will be a pivotal year in managed wordpress “awareness” for all business owners. Some will over-spend, some will under-spend and all small business owners will learn a lot this year as they experience lessons in website management.